19 So when it was evening on that day, the first day of the week, and when the doors were shut where the disciples were, for fear of the Jews, Jesus came and stood in their midst and said to them, "Peace be with you." 20 And when He had said this, He showed them both His hands and His side The disciples then rejoiced when they saw the Lord. 21 So Jesus said to them again, "Peace be with you; as the Father has sent Me, I also send you." 22 And when He had said this, He breathed on them and said to them, "Receive the Holy Spirit 23 "If you forgive the sins of any, their sins have been forgiven them; if you retain the sins of any, they have been retained." 24 But Thomas, one of the twelve, called Didymus, was not with them when Jesus came. 25 So the other disciples were saying to him, "We have seen the Lord!" But he said to them, "Unless I see in His hands the imprint of the nails, and put my finger into the place of the nails, and put my hand into His side, I will not believe." 26 After eight days His disciples were again inside, and Thomas with them. Jesus came, the doors having been shut, and stood in their midst and said, "Peace be with you." 27 Then He said to Thomas, "Reach here with your finger, and see My hands; and reach here your hand and put it into My side; and do not be unbelieving, but believing." 28 Thomas answered and said to Him, "My Lord and my God!" 29 Jesus said to him, "Because you have seen Me, have you believed? Blessed are they who did not see, and yet believed." 30 Therefore many other signs Jesus also performed in the presence of the disciples, which are not written in this book; 31 but these have been written so that you may believe that Jesus is the Christ, the Son of God; and that believing you may have life in His name. "Yes, come with your peace greeting quiet and warm, and allow me to sit close to your bosom! Around us the storm rages as wild as it can, With you it is quiet." (From Norw. song). Three times in this short text we hear the peace greeting from Jesus‘ own mouth: "Peace be with you!" Jesus had now been through a perfect life - as human being - according to God’s holy law. - He had been through suffering, judgement and death, because of the sin, and resurrection from the dead, for the sake of righteousness. The right to peace with God, and eternal life He now had won as human being, He now gives to whoever He wants, as He now had won this exactly as our representative, in our place, to our good. It is here you find the reason why Jesus at all can take this word, peace, in His mouth, in His meeting with sinners. We who read the gospel, certainly sees the situation, and will naturally ask: Has He nothing to accuse and chastise them for? After all everyone of them fell, they forsook Him, when He - from a human point of view - needed them more than ever, and one of them even cursed and swore that he did not know this man! In the expression, this man, Peter denies in reality Jesus as Messiah. That which was revealed unto him by Jesus Christs Father - a testimony he himself also had expressed in words. (Mat. 16:16-17). Then Jesus came in their midst, in the eve the same day (He did not wait long), while "the storm raged around them" - which the locked doors bear witness to. But just then is Jesus always so near - and the first He has to say to them, is: Peace! That tells us i.a. 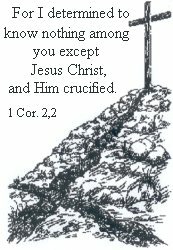 whose sins He atoned for on the cross. Something i.a. John witnesses in 1 John 2:2: "...He Himself is the propitiation for our sins." Seen on that background, it is only one greeting from Jesus that is natural, and that is: Peace. Their sins were after all paid for, and no one knew that better than Jesus Himself - so what should He accuse them for now? We are also seeing something like that when it comes to "the child of grace" Jacob in the Old Testament. He lied and deceived both his father and his brother, so he had to flee for his life, as the rascal he certainly was. But when the Lord reveals Himself unto him on the escape, out in the desert (the place the sin - in figurative meaning - always leads us), we do not hear one accusing word, but only an affirmation of the promise. (Gen. 28:13-15). Jacob was - in Gods eyes - hidden in this Jesus Christ who should come later on. Note! how Jesus gives His peace greeting address: Peace be with you! You shall have peace. You shall know that you have peace with God, by Me. It is this, which also is predicted by the prophet Isaiah: "He was pierced through.” Why so? So "we were healed” (so that we should have peace. (Norw. transl.). (Is. 53:5). By this we hear about one who will - has the deep desire - Jesus had to come to them the same eve, with His peace greeting - that we shall have peace, and to realize this, He did not spare anything, not even His sole Son, but gave Him up for all of us. (Rom.8:32). Note! All of us! It is here you see whether you really is loved by God, or not! Not on how you feel at any time, not on how good or bad your experience is in this life - because it is a great many things that can occur here, also for a Christian, but "He who did not spare His own Son, but delivered Him over for us all, how will He not also with Him freely give us all things?" The peace greeting is accordingly the same today: Peace be with you! Or do you want to tell Him straight up in the face, that you do not believe Him? Think if the disciples should have done something like that? But they knew Jesus so well, and here is their reaction also a testimony about Jesus unto us: "The disciples then rejoiced when they saw the Lord." (v.20b). They welcomed Him, and with that also His peace greeting, with thanks and joy. Because, if anyone has not accepted His word/message, they have not accepted Himself either. Now do that you too, you who are longing for peace with God - hear Jesus‘ word: God has made peace with you, by His life and His blood, and thank Him here and now, because it is reality - here and now! There was one here, who had great difficulties, because he himself had not seen Jesus with his natural eyes - it was the disciple Thomas. Jesus is going to considerable lengths for his sake, and let him both see and feel. Then there was no doubt in Thomas anymore about who he was dealing with: ""My Lord and my God!"!" (v.28). But Jesus do not speak highly of such attitude towards the apostles testimony: "And do not be unbelieving, but believing." (v.27b). An attitude which most Norwegians e.g. have too - yes, you will find it in the midst of the congregation too: "If I do not get to see, if not Jesus Himself, so at least a sign, a feeling or something of the sort." Jesus has a word for you here: "Blessed are they who did not see, and yet believed." (v.29b). Blessed! Imagine that. Any higher estate is not given in this world than to be blessed, but how many are aim for that? Jesus is then speaking about those who do not see Him with their natural eyes, such as the apostles here, but He does not speak about a blind faith, so to speak "out in air." There is talk of another attitude towards the apostles words, than what Thomas presents here. Then you will get to "see" in another way. The Spirit will make Jesus alive to your heart. He will open up your mind to understand the Scriptures. (Luke 24:45). He will “enlighten the eyes of your hearts,” as Paul is praying for the Ephesians (Eph. 1:18). The enlightened eyes of the heart so you can "see" Jesus in the Word - so your heart is righted on Him. Øivind Andersen (Norw. Bible teacher) uses this fine expression for the faith; the hearts directed (the Norwegian word is not possible to translate to an understandable English – something like directedness/aimedness) on Jesus. It has accordingly something to do with the attitude we basically have towards the Word of God. The word, about which Jesus said: "Your Word is truth!" The Word, about which the prophet David says: "The words of the LORD are pure words; As silver tried in a furnace on the earth, refined seven times" (Psalm. 12:6), and not least, about which the apostle Peter witnesses: "But know this first of all, that no prophecy of Scripture is a matter of one's own interpretation, for no prophecy was ever made by an act of human will, but men moved by the Holy Spirit spoke from God.." (2 Pet. 1:20-21). It is accordingly talk about the Spirits Word, not peoples. Therefore it is also the Spirit who must open them for us. That comprehension brings about the correct attitude towards the Word of God. You have to get it! But it also reveals that it is by the Word, the sight is given. Therefore John completes, by saying: "But these have been written so that you may believe - (accordingly by reading and hearing, what is written (important knowledge in our age of fanaticism) - that Jesus is the Christ, the Son of God;" - and then He says what have delighted the faithfuls hearts at all times, all those who have striven themselves to death under the laws commandments and claims: "- and that believing you may have life in His name.” (v.31). His name is in heaven and on earth a Saviors name - therefore: "Peace be with you!"